[SatNews] “We believe in a world where affordable, high speed connectivity is always within reach,” Steve Collar, CEO of O3b Networks. Three of the next four spacecraft to serve O3b Networks have entered their checkout phase at the Spaceport in French Guiana, preparing them for liftoff on Arianespace’s next Soyuz flight. The satellites will provide emerging market connectivity worldwide for O3b. 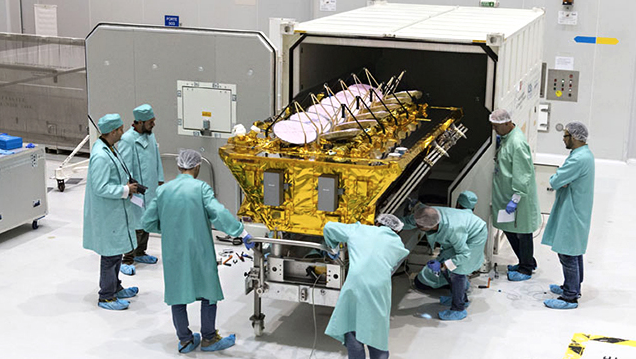 One of the three O3b Networks connectivity satellites is removed from its shipping container inside the Spaceport’s S5C clean room facility. Following their arrival in French Guiana last week, these Thales Alenia Space-built satellites were transferred by road to the Spaceport’s S5 payload preparation facility where they were removed from individual shipping containers that protected them during the trans-Atlantic cargo flight from Europe. drive even higher performance for O3b Networks’ low-latency network. This upcoming Soyuz mission is designated Flight VS10 in Arianespace’s launcher family numbering system, signifying the 10th liftoff of this medium-lift workhorse from the Spaceport since its Follow Arianespace's launch activity here.